Laundry tubs are a must in the junk garden. I have round and square, and big and small tubs. This tub was attached to a wooden table pedestal! This tub has a plastic hanging basket (with hook removed) of double impatiens just placed inside. Join me as I look back at laundry tub planters over the years from my blog. These laundry tubs of purple and white hanging-type petunias are from my friend Danita's gardens! Take a tour of Danita's gardens HERE. My sister in law, Kris, placed a tub on top of a cement birdbath pedestal. This is a great idea to add vertical interest to the garden! Last year, I added a thrift shop table's metal pedestal base to one of my tubs. All of the flowers used in this garden and tub are listed in the link above. Here is another laundry tub on a stand filled with calibrachoa (million bells) at my sister in law's house. Plant a couple of plastic hanging baskets in the tub for an early and magnificent display! Also from my sister in law's gardens, stacked tubs on a stool! 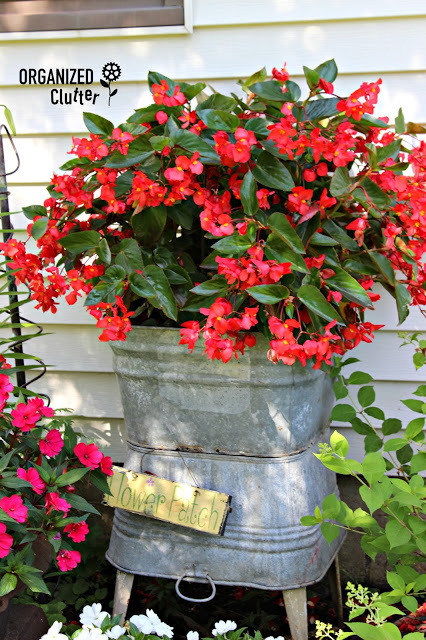 The top tub is planted with dragon wing begonias in a shady location. Take a tour of Kris's Yard of Flowers HERE. More double rosebud impatiens at my house on the shady north side of the house. 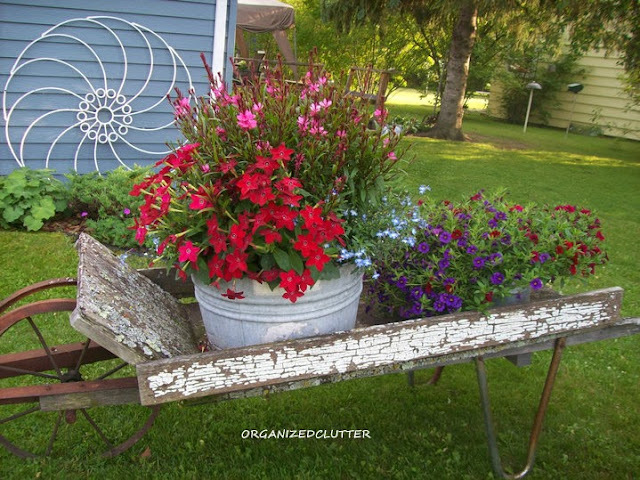 A vintage wringer, pump, and laundry stomper complete the junk garden vignette. Just look at this laundry tub on the left (at Kris's house) spilling over with abundant blooms of calibrachoa. Again, place a couple of 10" plastic hanging baskets in the tub to have early and lush blooms. Here, Kris has a laundry tub highlighted at the end of a narrow path in one of her gardens. A large oval tub on the patio, at Kris's house, is a perfect spot for geraniums and sweet alyssum. Did you see the old spout above the tub? 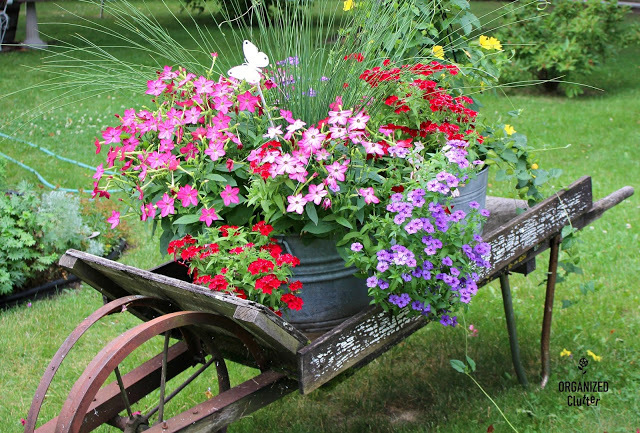 My favorite spot to display laundry tubs of flowers is in my old weathered wheelbarrow. Here nicotiana, annual phlox, and an annual spiky grass spill out of the front tub. Here red nicotiana and spiky pink gaura fill the round tub. Calibrachoa are in the right smaller tub. More calibrachoa and nicotiana here in the wheelbarrow. From another gardening season, annual phlox, trailing verbena, nicotiana, and geraniums. 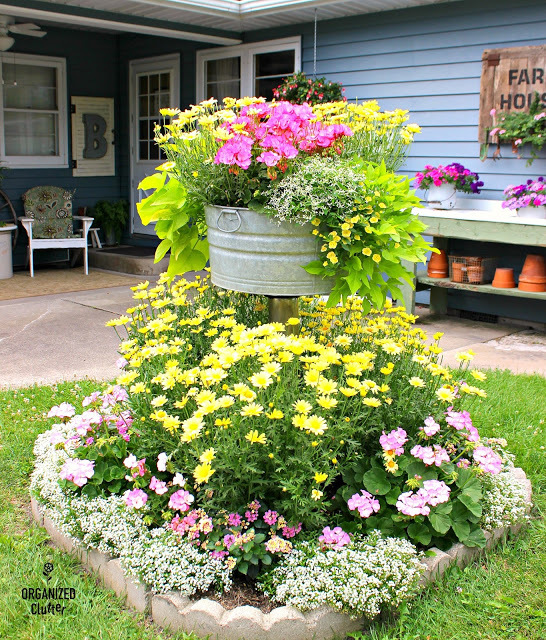 Here a laundry tub (cut in half) is painted yellow and tucked in the flower garden. This fun idea is my sister in law's too! More pink geraniums, alyssum and variegated geraniums from Kris's patio. Just plop the laundry tub IN your garden bed or border, like Kris. Here is a laundry tub of nicotiana in my flower border. Do you plant nicotiana? It's an underused favorite of mine. I love the star shaped blooms. I have tipped a wire tobacco drying basket over the tub and plants like a cloche. This tub of red dahlias at Kris's house is perfect all by itself! One season Kris added a Mod Podge image transfer to this tub. Her image is from the Graphics Fairy. 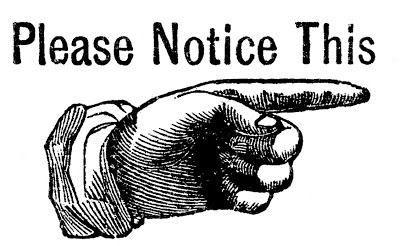 More info on this project HERE. Here is a tub in Kris's island border of diascia. Diascia is an underused, under-loved annual you should try. 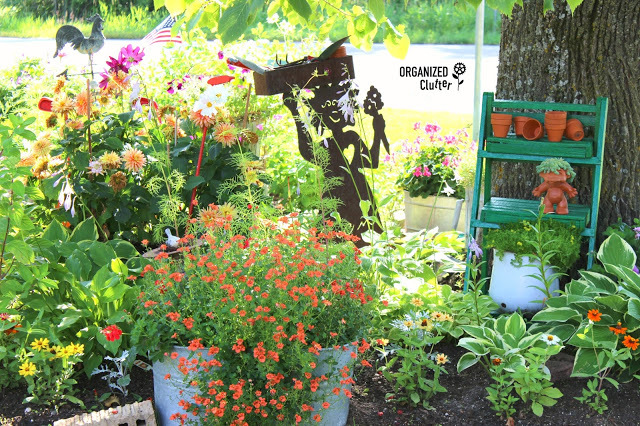 I hope you found some ideas to use in your garden! Hi Carlene - I love your posts and to see what you are up to!! This one especially made my day as we are all so tired of the long winter we are having here in WI and MN. I have never heard of Diascia and hope I can find it around here this spring. Thanks for starting my day with all the lovely gardens! This post was such good medicine for my winter weary soul! This Minnesota winter has been too long. Happy gardening (or dreaming about it).